Water management coupled with successful leak detection really does work, LDS Leak Detection Specialists Ltd saves the largest Home Park in the country £256,000 in 2 years! In December 2011, Glenn Willingham, Kings Park manager contacted LDS Leak detection Specialists Ltd regarding water loss on his site. Kings Park Village is the largest Home Park in the country with approximately 900 homes and very little information regarding pipework runs and positions and the site was only metered on the incoming mains. Leak Detection Specialists were commissioned to formulate a plan to try and cut down their water bills as Glen Willingham believed that the charges were too high for the amount of homes on the site. LDS's senior engineer Barry Cronin made the first visit to site in December 2011 and carried out an initial survey using accoustical testing of approximately 100 isolation valves across the site. On the first day of Christmas my boiler stopped working for me ? 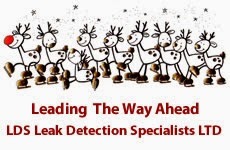 On the second day of Christmas my plumber said to me, "you have a leak on your heating you see". On the third day of Christmas my plumber said to me, "I'm struggling to find the leak for thee". On the fourth day of Christmas my plumber dug a hole big enough for him & me! On the fifth day of Christmas the pipes we finally did see, but now with a chisel hole or three..
On the sixth day of Christmas still no leak to see, oh where oh where can it be ? On the seventh day of Christmas a wise man said to me, why don't you try a leak detection specialist company? On the eighth day of Christmas I had a look on line to see. On the ninth day of Christmas a man from my insurance I did see, don't worry he said, it will be covered on my household Trace & Access policy. On the tenth day of Christmas I found the one for me, booked the engineer from LDS to see.